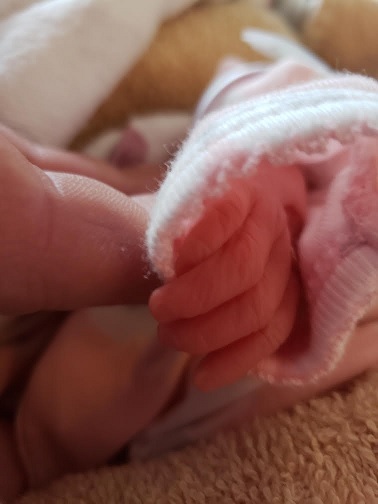 Ashlynn Katherine McIlwee, infant daughter of Sean Brian McIlwee and Cassie Jo Bishop, became Heaven's angel on January 12, 2019. Visitation will begin at 10:00 am, followed by services at 11:00 am, on Monday, January 21, at Parkville Family Church of the Nazarene, 6321 NW Union Chapel Road, Parkville, MO. Private family burial will follow at Glenridge Cemetery, Liberty. A reception for family and friends will be held after services and burial. Memorials are suggested to St. Jude Children's Hospital. For those unable to attend, Ashlynn's service will be available on www.parkvillefamilynazarene.org under the "LIVE STREAM" tab. Along with her parents, Ashlynn leaves her siblings, Easton, Kaitlin, Elissa, Madison, Hailey and Jacob; grandparents, Patrick and Katherine McIlwee, Cyndee and Barry Bishop; great grandparents, Charles and Shirley Lassiter and Delores Rasch; aunts and uncles, Katrikk Heninger (Steve), William McIlwee, Timothy McIlwee (Shena) and Brianna Bishop; as well as many cousins and other family members. Visitation will begin at 10:00 am, followed by services at 11:00 am, on Monday, January 21, at Parkville Family Church of the Nazarene, 6321 NW Union Chapel Road, Parkville, MO. Private family burial will follow at Glenridge Cemetery, Liberty. A reception for family and friends will be held after services and burial. My deepest sympathies to you all. Much love. My heart breaks for you both. Healing after the death of a child takes a lot more than just time. It takes a great deal of ❤️ work. So be gentle on yourself, and take all the time you need. Keep your head up. God is holding her in his arms. Love you.